At Same Day Printing we continue to invest in the latest digital printing and finishing equipment to provide you with a range of last minute offline marketing solutions to help you not only increase brand awareness but more importantly generate more leads and sales fast. One of the ways to do this is Point-of-Sale (POS) or also known as Point-of-Purchase (POP) offline marketing situations where your customers and or prospects are physically. POP promotions are designed to encourage purchases right at or near the register and today’s POS ads are changing all the time. I have no doubt that you have read, heard and we certainly appreciate that some of our digital online marketing colleagues may suggest that it is hard to quantify the exact statistics surrounding the results that can be achieved by POS advertising because it is not immediately trackable and that there are so many unspoken factors go into a decision to purchase. That said, it’s a widely held opinion in the branding world that POS advertising offline not only helps you increase brand awareness it can greatly influence immediate purchases. While we won’t go into detail today, although not as immediate there are still ways that you can measure and quantify your results, the simplest of which may just be a spike in sales but it is important to consider how and what the right monitoring tools you can put in place to measure your results. 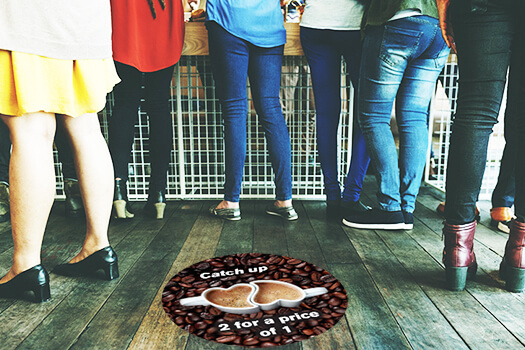 When people think about and consider Point of Sale marketing it is generally in connection with retail and restaurant environments. However, a point of purchase can work for other businesses as well and it can used at a meeting table, a reception counter, or even on your teams uniforms and or vehicles while on a clients site. To help you ensure that you put your best foot forward with your next, we have and continue to invest in both class leading Small Format and large format Full Colour Digital Printing solutions which offer you cost-effective, short-run and fast virtually on-demand printing. With the online world becoming an ever-increasing competitive place to be found or seen, engaging a good cross media marketing strategy that includes offline marketing solutions will certainly help support your marketing efforts. If you have something in particular you would like to consider or happen to be stuck for ideas, please give us a call, we are more than happy to discuss some possible solutions to help you create more awareness and generate more sales. Remember, even when time is short, don’t miss out on an opportunity to promote your business. Wishing your all the best for creating and activating effective and efficient marketing in your business.